An article in yesterday’s Guardian caught my attention. One of the last remaining Gondwanaland forests is being destroyed as wildfires ravaging Tasmania turn 1,000 year old trees to ash. It’s tragic to see our last living link to a Gondwanaland — a continent that broke away from Pangea 180 million years ago — destroyed before our eyes. The importance of these forests was recognized when they were included in the Gondwana Rainforests of Australia UNESCO World Heritage site. But simply designating a site doesn’t protect it. Over the past year, our TV screens have been filled with images of other World Heritage sites being destroyed. Images of Taliban and ISIS rockets slamming into ancient statues. It’s hard viewing and everyone is quick to condemn. It’s also easy to rationalize that we’d never do that – we’d protect precious sites like this. But do we? What’s happening in Tasmania shows we don’t. We are responsible for this one – all of us. Unlike many forest types, this one is not adapted to fire. A perfect storm of climatic events dried out this normally damp forest and a dry lightning storm then ignited it. These are all natural events, but their confluence is driven and amplified by climate change. And the only way to prevent further loss is for all of us to feel responsible and act now. Wasting every drop? The north-south divide. With El Niño finally starting to drench California, barely a day goes by without a news story covering it. Yesterday’s Marketplace had an in-depth report on the winter rains in Los Angeles that featured many of my former colleagues from my time in Los Angeles working on water issues. It’s a great piece and is well worth the seven minutes it will take you to listen to it. It argues that while LA was engineered to prevent a repeat of the 1930s floods by flushing water to the ocean , it is now time to re-engineer the city to capture rain and get it back into the groundwater so that we can re-use it. It’s hard to argue with the desire to recharge the aquifer. Not only does it bolster local water supplies, but it prevents ocean pollution. There are many groups working on this, foremost among them the City and County of Los Angeles and their non-profit partner, TreePeople. It’s in stark contrast to the news reports of the winter rains up in the Bay Area. Here rainfall also runs to the Pacific Ocean. But when it’s covered in a story the reporter is more likely to discuss how it provides the much needed pulses of fresh water that rejuvenates rivers and stimulates the salmon to return. To oversimplify it. In northern California environmentalists fight to keep water in creeks so it can flow to the ocean. While in southern California environmentalists fight to infiltrate water into the aquifer so that it does not flow to the ocean. Even in Los Angeles there are remnant wetlands and natural bottom creeks that need the pulses of fresh water brought about by winter rains to survive. The recently restored Malibu wetlands is one example. And a stones throw from LAX is the Ballona wetlands that is in desperate need of restoration. So yes, we need to capture more water and return it to the aquifer. But even in Los Angeles we need to acknowledge it benefits the streams, rivers, and wildlife when rainwater flows to the ocean. It’s not waste! It’s part of the natural order that I am hopeful will be restored over the coming decades as Los Angeles re-engineers its water system. Is private forestland at risk as owners age? A recent report on NPR’s market place about family forests in the United States caught my ear. It argued that 2016 was shaping up to be a big year for sales of family-owned forests face. This has been a common refrain in the almost 20 years I have been working on forestry issues in California. But much of the report did not ring true to me – at least not here in California. First it suggested that 2016 may turn out to be a big year for the sale of private forest land. And second, that the biggest threat was that family forests would be sold to industrial owners who clear cut the forest and ship the logs overseas for the export market. Every year I have heard the refrain that this year will be the year when the older generation dies and the forest land they assembled is sold off. It’s certainly true that people age, but I’m not convinced that 2016 is shaping up to be any worse than 2006, or 1996. The sad truth is that we lose many acres of productive forest land to other uses every year. Second, I have seen little evidence that the primary “risk” is that the forest will be purchased by an industrial owner who will turn around, clear-cut the trees, and ship them overseas. Unfortunately this continues the outdated narrative that “forestry” is bad and anything else is “good.” In my experience, the larger industrial owners are unlikely to purchase smaller family forests as the values tend to be driven by real estate and hence relatively high. And even if they did, they manage them with a long-term perspective for their wood and forest values. By far and away the primary risk today is that the forest will be broken up and sold off as individual parcels for home sites. From a conservation and forestry management perspective, this is a disaster. Not only are smaller parcels harder to manage for wood production, they also fragment the landscape for wildlife as homes and people invade what was once wildlife habitat. Fortunately, landowners these days are faced with many smart options to protect their forest land and handle complex estate planning needs. In California there’s a growing trend for landowners to make use of conservation easements to protect the land against fragmentation and aggressive timbering, while allowing it’s continued productive use as timberland, and reducing the burden of estate taxes on the family. The final irony in the news report was the owner they interviewed planned to build small cabins around the property for his kids. While I appreciate the sentiment of connecting the kids to the forestland, these cabins introduce their own disruption and may make it that much harder to manage the land for its forest and wildlife values in the future. So why should any of this matter to the average American? I’ll just take California as that’s the landscape I know the best. California has 33 million acres of forestland. Of this, some 9 million is owned and managed by private families – compared to 5 million by the large industrial owners. This forestland gives us so much everyday. It cleans our air. Stores carbon dioxide that is driving climate change. Is the source of much of our clean water. Provides the wood we use to build our homes. And of course, it’s also a source of inspiration. Protecting our forestland is not a luxury. It’s a necessity. California’s Private Forestland is at Risk of conversation. Is it time to make the initiative process more transparent? I was just reading an article about the Plastic Bag initiative that recently qualified for the 2016 election. My interest is more than passing, as securing a state-wide ban was a major success while I was at Heal the Bay. It had taken years of work, resulting in a political compromise that was signed into law by Governor Brown last year. Now it’s on hold after the plastic bag manufacturers put up $3 million – 98% from out-of-state money – to collect the signatures to put it to a vote of the electorate. The crazy part is that by simply qualifying the initiative the ban is now on hold. By some estimate, every additional year they can sell single-use plastic bags in California generates another $15 million in profit to the manufactures. In other words, for a payment of $3 million they will earn a five-fold return each year. I wish I could get that type of return on my savings account! In fact, the industry will have won handsomely even if they lose in 2016. I’m not going to rehash the merits of banning plastic bags — that story has been told. And in fact, about half of all Californians live in municipalities that have already banned bags. But it does again raise the whole question of the initiative process. To me what is most egregious is the misleading way that signatures were gathered. I know because I was asked for mine outside a local Trader Joe. Inside the store the vast majority of people were bringing their re-usable bags, while outside they were being asked whether they could “spare a minute to save jobs.” I bet most people didn’t know what they were signing or that the person collecting signatures was likely being paid a dollar or more per signature gathered. Or that the jobs issue had been dealt with in the bill that was signed in to law and that it would create new green jobs in California. There’s a lot of debate at the moment about money in politics as almost limitless amounts slosh around. Much as there’s a desperate need for transparency at the top, I feel it’s past time for transparency in the initiative process. By all means go and collect your signatures. Just make it clear at the point of signing who is behind the initiative and how much the signature gatherer is being paid for you to sign. A more radical idea is to accept the concept that you can put almost anything on the ballot if you have enough money to spend (or invest as this case shows). As an alternative to the signature gathering process, let’s just have a limited number of slots on each ballot and sell them to the highest bidder. The funds collected could then go to fund voter education programs. Perhaps over time an educated electorate who turned out to vote would slow this craziness. 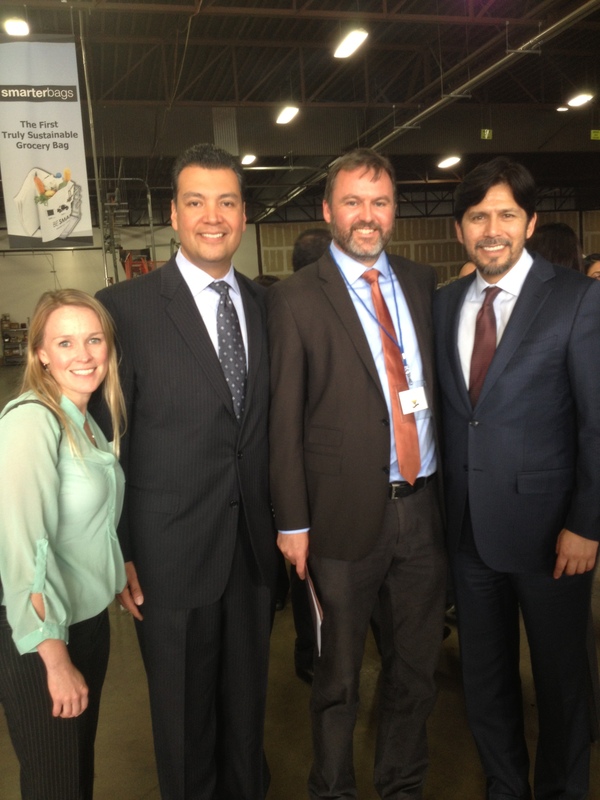 With Senator de Leon, Senator Padilla, and Sarah Sikitch at the conference announcing the Bag Ban. Governor Brown is so far ahead in his race for re-election that he’s throwing his weight, and war-chest, behind the campaign to pass Proposition 1 and 2. That’s the water bond and the state’s “rainy day” fund. I’ll be voting yes on the water bond. It’s a smart investment in the state’s water future. It will enable us to clean up groundwater, invest in conservation and recycling, and develop stormwater capture projects. I have yet to make a decision on Prop 2, But the imagery being used for the “rainy day fund” is just wrong in the context of a joint campaign. The picture of an umbrella shedding the rain is as classic as it is wrong. In the context of the water bond, the last thing we want to do is to shed the rain — we need to capture it and save it for later! The same is true of course for excess revenue during flush years. One of the problems we face across the state is we have paved over the earth and now when it rains water is shed from our cities, picks up pollutants and rushes into our rivers, bays and ocean. We need to turn the umbrella upside down — to use it to capture the rain where we can direct it back into our groundwater to be used during the inevitable dry times ahead. Doing this will help our regions secure their own water futures. So nice job marrying these measures up, Governor Brown. You just need to overhaul your imagery! I was in downtown LA earlier this week and took the chance to walk across the Fourth Street Bridge, It wasn’t high, but it made me dizzy. It was as if the world had been converted to straight lines. Everything from the shape of the skyscrapers, to the train tracks, roads, power lines, and the Los Angeles River itself had been forced to follow a simple set of geometrical rules. Ironically, the only sinuous line was that of the tyre treads that had found their way into the river bed to cavre doughnuts. Climate change is real. Don’t get me wrong. Even before we started pumping CO2 into the atmosphere like it was going out of style it has always been happening — we have just accelerated it. But these days, despite the notorious deniers, you cannot participate in a story about nature without it coming to the fore. Take this past week. It’s been a wild week in the oceans down here in Southern California. First there was the proliferation of great white shark sightings, then an 18 foot long oar fish, followed by a rare saber tooth (or is is an even rarer Ginko-toothed beaked whale? ), and another oar fish (this time a 14 foot baby). Must be global warming. Right? Well my sources say that is what every interviewer wants our scientists to say. They try to lead them down that path — warm ocean, unseasonable temperatures acidification? Climate change is real: but let’s not lead the witness. These discoveries are remarkable enough without ascribing them to global warming. They are giving us a glimpse of the unseen beauty of the ocean. Isn’t that reason enough to protect it? I think so.